A few years ago James Pickering was in New York visiting his friend, Timothy Warr, when the duo spotted a brightly upholstered chair in a shop window. It was a poor quality reproduction piece but, despite its outrageous price tag, was attracting a lot of attention. 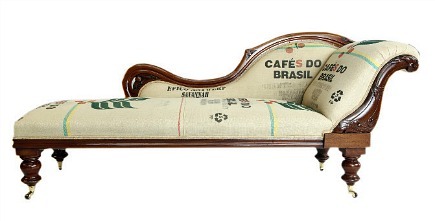 It was a “we can do that, but better” moment, and in less than an hour Antique2Chic was born. Warr, a restorer and upholsterer, refashions antiques with a modern, visual approach to help change the way many people view antiques. His bespoke pieces are refinished using traditional antique restoration processes. When it comes to sourcing fabrics, top well-known manufacturers as well custom designs are used. 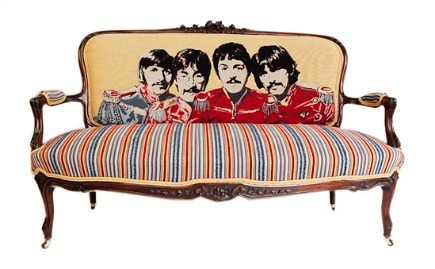 He is found of British fabric themes as well as pop culture and contemporary art fabrics. So when you inherit a vintage sofa from Aunt Fran that is just not your style, look at it from a different angle — one suggested by the Antique2Chic aesthetic. With a little imagination and restoration, and a bold choice of fabric, it can take a place of pride in your living room. Very cool! The first is my favorite!